4 Weeks Ago (1:47 PM). Edited 4 Weeks Ago by DrFuji. For my hack, I'm keeping most of the original intro (where you get your first pokemon etc.) from pokemon emerald. However, I've ran into a few problems which I need some help with. As you know, when the you create a new save, you'll see the professor explaining something about the world of pokemon. 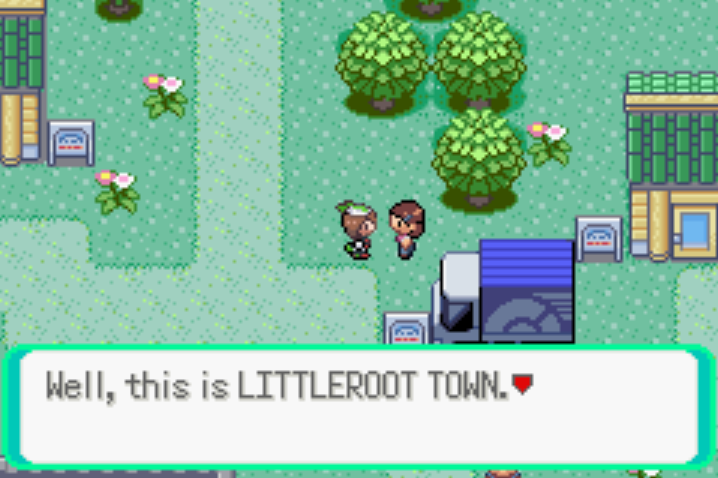 In this dialog he welcomes you to Littleroot Town. I want to replace this with the name of my own town. How can I edit this script as it doesn't show up in A-map like all other scripts. The second problem occurs when the player chooses to play as a Girl. When I designed my starting town I made sure the starting point for the boy was the same as the original so I wouldn't have any problems with that. Little did I know the girl would spawn in the other house, which I did move to another location. I've already tried moving the truck, hoping it would move the starting script with it. This didn't solve my problem, however. What can I do to make the girl and the mom spawn in front of her house? Here's a picture to illustrate the current situation. Also, how can I edit this dialog to say the name of my town aswell? I can't seem to find it in A-map either. 4 Weeks Ago (7:04 AM). It isn't a script. You will have to search for the original text in Advance-Text and edit the dialogue that way. 4 Weeks Ago (7:36 AM). Advance-Text has a reputation of messing up your rom. I would recommend searching for the text in a Hex Editor and manually change it from there.